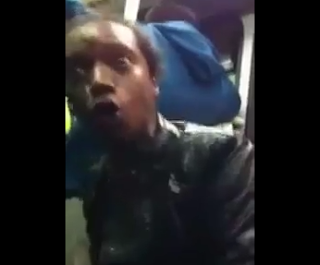 The Black lady, who was seen racially abusing white commuters on a London bus, has now been named by police as 35 year old Vandell Brooks of Kingsland Road Hackney. She has been charged with racially/religiously aggravated harassment/alarm/distress by words/writing (contrary to Section 31(1)(c) and (5) of the crime and disorder act 1998. With the jurisdiction of the Central Criminal Court, she has been unconditionally bailed to appear at Thames Magistrates Court on 23rd of November this year. All of the mainstream media appear to have lost interest in the case, unlike those of Emma West and Jacqueline Woodhouse . I phoned Thames Magistrates Court yesterday (Friday 23rd Nov 2012) and was told the Vandell Brooks had failed to appear and a warrant has been issued for her arrest, without bail. On 12th January 2013 Vandell Brooks was found guilty of Racially/Religiously Motivated Harassment and Failing to Appear. The trial was kept secret by the police who refused to give out details until after the court case. She was sentenced to 7 days prison and a £200 fine. Jacqueline Woodhouse was given 21 weeks for a less aggressive outburst, assumable because she is White.